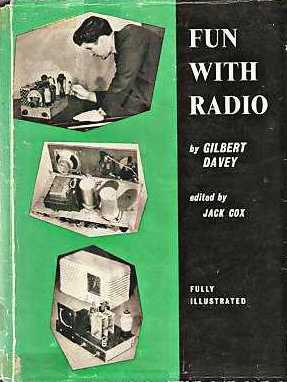 Gilbert Davey's best-known book, Fun with Radio, first appeared in 1957, and featured many of his designs that had appeared in the Boy's Own Paper since the war. It ran to six editions as below, with content revised to take account of component availability and the move to widespread use of transistors, but valves were never entirely eclipsed. The early editions, with all or most of the diagrams produced by R Barnard Way, are perhaps the most appealing. Dust jacket of Fun with Radio, 2nd edition, 1959. With Jack Cox as Editor throughout, and much content drawn - at least initially - from Boy's Own Paper articles, Fun with Radio and Davey's other Fun with . . . titles might well be thought of as "BOP offshoot publications" as much as the books listed on that page. But as the work of a single author rather than compilations of articles by different authors, and produced under a different publisher, Edmund Ward Ltd (later Kaye & Ward Ltd), they deserve to be treated separately. A further edition is often seen listed on booksellers’ web sites, ostensibly published in 1986 by Sportshelf & Soccer Associates, New Rochelle, New York State, USA. Doug Brown has kindly looked into this, and his findings show that Sportshelf & Soccer Associates was an importer of many English-language books for the USA market - many years after publication in some cases - and distributed them with their own stamp on the title-page. Before using the list, please read the caution and usage notes on this section's introductory page. Fun with Radio, 1st to 4th editions: Edmund Ward Ltd; 5th & 6th editions: Kaye & Ward Ltd.
Own Paper's radio expert and as a broadcaster. Reasons given for excluding transistor designs. See THE BEGINNER'S 1-VALVER page. Reprinted from BOP March 1952.
should go to LT-ve, not LT+ve. Note: protection as described is inadequate by modern standards. Brimar SB2 metal rectifier or equiv. ; smoothing capacitors. Note: non-isolated HT supply. Suitable enclosure required. output transformer, speaker, heater transformer. Suitable enclosure required for protection from mains. sets for use in DC mains areas. to work up as complete set, incl. mains power supply. Eddystone, Raymart or Denco plug-in coils suggested. 2nd edition Missing from British Library collection, but checked by purchase. Published just two years after the first, this edition anticipates the appearance of Fun with Short Waves the following year by dropping the chapter on short-wave sets, and substituting a chapter on "Transistors and Transistor Receivers". Other chapters are unaltered, but as noted below, substitute valves and connections are given for the old 2-volt types. trade and press for favourable reception of 1st edition. Reasons given for reprieve of outdated Cycle Radio design. Details given for substituting 1.4-volt valves for 2-volt types. they were becoming cheaper and more easily available. (PNP) transistors, and precautions against heat damage. deaf-aid type earpiece, or output transoformer, speaker. 2 stages as first stage above, then substitute OC72 in output stage. 3rd edition Not checked - missing from British Library collection. I have not yet been able to inspect a copy of the third edition, but I can give the Contents list as follows, kindly sent to me by Philip White. As can be seen, it is identical to that of the second edition, and perhaps therefore few revisions were made. 4th edition Many of the original layout drawings from the first edition, by R Barnard Way, are still in use, although often now accompanied by explanatory notes regarding substitute components. The dust-jacket photo-montage includes a small image of the Studio ‘E’ one-valver, although it is the usual Fun with Radio one-valver that is featured in the book. The Cycle Radio is dropped at last, and a new chapter on amplifiers, record players and high-fidelity appears. Mention of other Fun with . . . titles published. written expressing pleasure from them. Repanco DRR2 (MW, LW, R used as A). DF91 (1T4) or DF96 (1F1) - different base connections. phones or output transformer and speaker. Teletron HF2 and D/R, and W21, W21, PM22A. DL91, DL91, DL94; output transformer, speaker. Speakers mentioned - Wharfedale 10", WB Stentorian. Amplifiers mentioned - Mullard 3-3 and 5-10.
not to be used for experimenting. Radio feeders - Jason FMT1 for FM; superhet for AM. General advice on record decks and styli. edition (actually first appeared in 2nd edition). Coils for home constructors in short supply. 5th edition The fifth edition was the last to be published in the larger format. Valve designs still predominate, but the declining availability of components, especially coils, entails many revisions to them. but insists that little remains unaltered since first edition. Note concerning shortage of coils for home constructors. with Short Wave Radio for other transistor designs. No. 5 - copyright date 1968). Unit Nos. 6 or 8 - Mains power supplies. kits once again coming into their own. 6th edition The final edition is in the smaller format. Apart from the Beginner's One-Valver and the Simple High-Fidelity Valve Amplifier, this edition is all semiconductor-based. exemplified in Jamboree of 1975.
solid-state technology. Advice on tools, soldering. (MW tapped, R). For use in reflex transistor receivers (Chap. 6). Homebrew coil b) as Chap. 2 (A, MW, LW, R used as alt. A). 2 x OA90; 1.5v cell. transformerless output to speaker 8Ω. CONTACT ME As noted above, I have not yet been able to examine the third edition of Fun with Radio, but continue to search for it. Meanwhile, if you have a copy of this edition, and would like to send me chapter details as laid out above, I would welcome this help in completing the list.